Overview - Autumn Sonata was the only collaboration between cinema's two great Bergmans—Ingmar, the iconic director of The Seventh Seal, and Ingrid, the monumental star of Casablanca. 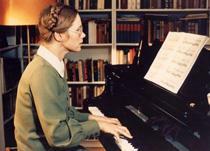 The grand dame, playing an icy concert pianist, is matched beat for beat in ferocity by the filmmaker's recurring lead Liv Ullmann as her eldest daughter. Over the course of a long, painful night that the two spend together after an extended separation, they finally confront the bitter discord of their relationship. This cathartic pas de deux, evocatively shot in burnished harvest colors by the great Sven Nykvist, ranks among Ingmar Bergman's major dramatic works. As contradictory as it might sound, sometimes there is a fine line between love and hate -- especially when family is concerned. Relationships between parents and their children can be especially complicated, and while fathers and mothers are often expected to innately love their sons and daughters, this seemingly inherent compulsion toward nurturance and compassion isn't always guaranteed. From legendary Swedish director, Ingmar Bergman, and starring legendary Swedish actress, Ingrid Bergman, 'Autumn Sonata' reveals the devastating consequences of neglectful motherhood, exposing the mournful bite of lingering resentment and the scornful sting of unhealed wounds. A noteworthy collaboration between two giants of cinema, the pensive drama features heart-wrenching performances and quietly haunting images, creating a distressing but powerful piece of existential storytelling. After several years of estrangement, a famed concert pianist, Charlotte (Ingrid Bergman), comes to visit her oldest daughter, Eva (Liv Ullmann). Though the pair seems happy to see each other at first, tensions gradually build as old resentments are reignited. Throughout the day and night, the two try to work through their issues, but the bitter pain of the past casts a devastating shadow over their relationship, potentially dooming any chance they have at true reconciliation. With a narrative structure heavily reminiscent of theatrical plays and a self-contained, intimate scope, the movie becomes a stirring chamber piece, keeping its focus squarely on its two dueling protagonists/antagonists. The relationship between mother and daughter is full of pain and grief, and the manner in which the filmmakers slowly unravel the full extent of their animosity aches with tension. Initially, the two appear genuinely happy to be reunited, but as time goes on these joyous expressions become nothing but a facade, and eventually they fade away entirely, making room for an explosion of hateful accusations, devastating confessions, and heady philosophical discussions. To this end, the film isn't always pleasant to watch, and there are times when some of Bergman's dialogue is a bit too on the nose, elaborating on concepts that don't need to be explained -- but the core ideas of abandonment, resentment, regret, communication, hatred, responsibility, and guilt that the script examines are fascinating, and the performances and visuals give the weighty content an utterly absorbing pull that subtly demands attention. Though the two spoke of working with each other several times throughout the years, 'Autumn Sonata' marks the first and only collaboration between Ingmar and Ingrid Bergman (who are of no relation), and apparently this partnership was a little rocky. As evidenced in the included special features, Ingrid never quite saw eye-to-eye with the script and constantly questioned her character's dialogue and decisions (much to the frustration of her director). Likewise, Ingmar was initially appalled by the famed Hollywood star's old fashioned acting style, and soon wondered if her casting was a mistake. Thankfully, despite these potentially damning conflicts, the two legends were able to compromise to great success, and the stunning results speak for themselves. In her last big screen performance, Ingrid Bergman is simply remarkable, crafting a character that is cold and unlikeable while still retaining a surprisingly powerful core of vulnerability and even sympathy. Charlotte is a workaholic who chose to pursue professional success instead of spending time with her husband and daughters, and these close parallels to Bergman's own life as a constantly working actress clearly resonate on screen. In the end, though she feigns basic affection, one gets the sense that she may not even know how to love at all, and what's worse is, she becomes acutely aware of this tragic flaw. The actress tackles all of these complicated emotions with expert precision and affecting pathos, and as certain revelations and admissions are made, her character goes through several dramatic turns and emotional reversals, covering a wide gamut of moving drama. Serving as Ingrid's cinematic sparring partner, is Liv Ullmann, a mainstay of Ingmar Bergman's storied filmography. In the role of Eva, Ullmann is equally impressive, balancing her character's outwardly meek demeanor with a more searing undercurrent of hidden scorn. Her early attempts to make a connection with and seek approval from her mother are heartbreaking, and her later turn toward vengeful vitriol is made all the more impactful thanks to the actress's slow-burn approach. Watching the two women bounce of each other is equally mesmerizing and distressing, and as their words begin to stab like daggers, one can see the still throbbing damage of their past in every mournful glance and lingering close-up. Speaking of close-ups, the director and cinematographer create a palpable air of solemn lamentation, marked by an artful focus on their stars' ambiguous expressions. There are times when it's hard to truly read Eva and Charlotte's emotions, but this dramatic intricacy is only enhanced by the camera's intimate vantage point. Compositions are also impeccable, with meticulously framed images that show a rare mastery of blocking. The manner in which Bergman positions his actors is paramount, and the specific amount of screen space between them, or the way in which their faces are juxtaposed against one another, speaks volumes about their state of mind and relationship through pure imagery. Covered in a fog of autumnal hues, the color palette itself goes a long way to bolster the movie's isolated mood as well, and while the picture is full of warm tones, there is little actual warmth beneath their surface temperament, perfectly paralleling the characters' own veneer of superficial cordiality. Going along with this reflective style, is a carefully measured sense of movement, with slow camera tracks, zooms, and reframing extended shots that render most cuts purely functional or delicately deliberate. One scene even features some particularly effective crosscutting that transitions between Charlotte getting ready for dinner, and Eva discussing her mother with her husband, mindfully contrasting the two characters' misreading of each other. Taking a cue from some of his earlier works like 'Persona' and 'Winter Light,' Bergman also injects the proceedings with a few additional stylistic flourishes. Understated flashbacks are organically interspersed throughout the proceedings, gently giving form to the characters' persistent traumas. These sequences have a faintly dreamy quality to them and are almost exclusively conveyed in thoughtfully constructed single static shots, evoking the point of view of a theater production. Another motif sees characters talk to themselves in soliloquy-like monologues or even address the camera directly. These overt techniques might sound like they'd clash with the film's otherwise naturalistic sensibilities, but somehow Bergman hones these traditionally unrealistic practices in with such a deft and delicate hand that they become essentially seamless. Full of harrowing emotion and agonizing insight, 'Autumn Sonata' offers a methodically potent examination of the pain we choose to keep inside, and the scars that stay with us as a result. As Charlotte and Eva finally confront their true feelings for one another, they are also forced to examine the way they look at themselves, blurring the line between blame and responsibility. Like most of Bergman's films, the picture is rife with existential questions and somber reflections, probing deeply into the mysteries of life's inherent challenges. And, while depending on one's interpretation, the ending might offer some level of optimism and catharsis, the film's elegiac mood and nearly unbearable confessions of hate and indifference remain irrevocably haunting. It might not be quite as layered or cinematically memorable as some of the director's other masterpieces, but the movie remains an impeccably composed piece of motion picture drama. 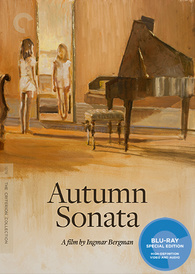 Criterion presents 'Autumn Sonata' in their standard clear keepcase with spine number 60. The BD-50 Region A disc comes packaged with a booklet featuring an essay by critic Farran Smith Nehme. The movie is provided with a 1080p/AVC MPEG-4 transfer in the 1.66:1 aspect ratio. Cast in rich autumnal shades, this is a lovely and seemingly authentic transfer that captures the powerful mood of Bergman's images wonderfully. The print is in very good shape, but there are some fleeting specs and occasional vertical lines. A moderate to heavy layer of grain is present throughout, and while this maintains a gorgeous filmic quality, there are a few isolated moments that look a tad noisy and perhaps ever so slightly compressed. Detail is often striking, especially in Bergman's many mournful close-ups, highlighting all the uncertainty and pain in his characters' ambiguous expressions. The color palette is warm (though comparatively cooler than the previous DVD), favoring yellows, oranges, browns, and bold reds, adding some rich pop to the proceedings. Contrast is nicely balanced and while shadow detail is solid, blacks can look faintly blue in some shots. Outside of some extremely minor compression issues, this is a spectacular transfer. With sharp clarity, lovely texture, gorgeous colors, and striking cinematography, Bergman and cinematographer Sven Nykvist's images are given the respect they deserve. The audio is presented in a Swedish LPCM mono track with optional English subtitles. Though exceedingly quiet, the stark silence of the mix works beautifully with the grave subject matter, and the audio is technically strong. Essentially purely dialogue driven, the track is almost devoid of notable background sounds and there is no traditional score. With that said, a few sparse effects (a ticking clock, for example) do come into play during isolated moments, and one pivotal scene features the characters playing the piano, and these instances feature pleasing fidelity and balance. The real focus here, however, is on speech, and the characters' conversations come through strongly with clean and full-bodied dialogue throughout, giving delicate presence to every soft spoken confession, and assaulting command to every angry diatribe. Thankfully, I detected no major instances of crackles, hissing, or pops. Understated to great dramatic effect, Bergman's use of sparse effects and silence is captivating. While there really isn't much to the track, the dialogue is the real draw here and it sounds great with no pesky age-related issues. Criterion has put together an outstanding collection of comprehensive supplements, including a commentary, a 207 minute documentary, and interviews with the cast. All of the special features are presented in upscaled 1080i with Digital 1.0 audio and optional English subtitles for the foreign language portions (unless noted otherwise). Audio Commentary with Peter Cowie - Bergman expert Peter Cowie offers a very informative discussion on the film filled with production trivia and a wealth of details about the director and cast. Cowie offers some background info on Bergman, addresses the movie's place within his larger filmography, and analyzes his visual style and themes. He also elaborates on how Ingrid Bergman got involved in the project and addresses the sometimes heated conflicts that arose between the actress and the filmmaker during the shoot. Introduction by Ingmar Bergman (HD, 8 min) - This is an excerpt from a 2003 interview with the celebrated director where he elaborates on his working relationship with Ingrid Bergman, revealing how he was horrified by her initial overacting on set, but worked with her to refine the character. The Making of 'Autumn Sonata' (HD, 207 min) - Presented in 1080p, this is an absolutely exhaustive, fly-on-the-wall look at the film's entire production. We get intimate looks at the cast and crew during pre-production meetings, table reads, preliminary rehearsals, dress rehearsals, and the actual shoot. As Peter Cowie and Ingmar Bergman revealed in the previous supplements, there was some tension between the director and Ingrid Bergman, and here we actually get to see what they were talking about -- namely the actress's constant questioning of the script. We also get a glimpse of the early over-acting that had Ingmar so worried, but despite these occasional conflicts, the cast and crew seem to get along well and there is a lot of laughter and joking around in between takes. Most fascinating of all, however, is getting to see Ingmar Bergman as a director in action. His attention to every detail, including the actors exact positions and movements is incredible, and he comes across as a passionate but firm artist. One sequence set at a press conference for the film is especially amusing, as Bergman decides to take control and literally directs the journalists to move their chairs and rearrange themselves to his liking. With over three hours of essentially raw footage, this doc is kind of overkill, but fans of the director should be delighted by all the candid peeks into the legendary filmmaker's creative process. Liv Ullmann (HD, 19 min) - Presented in 1080p, this is a recent interview with actress Liv Ullmann along with some behind-the-scenes footage from the previous doc. The frequent Bergman collaborator (and mother of one of his children) details what it was like to work with the director and her famous co-star. She also addresses the freedom and restrictions that Ingmar placed on his actors and elaborates on some of the arguments that arose between both Bergmans. Ingrid Bergman at the NFT (HD, 39 min) - In this interview and Q&A conducted in 1981, Ingrid Bergman talks about her career, path toward Hollywood, acting in different languages, and what is what like to work with so many famous directors. Though not exactly in-depth, the conversation is wide-ranging and Bergman comes across as friendly and charming. 'Autumn Sonata' is an impeccably performed and visually striking drama that devastates with harrowing insights. This lone collaboration between director Ingmar Bergman and actress Ingrid Bergman results in a powerful piece of motion picture art -- one that serves as a fitting swan song for the legendary performer's storied silver screen career. The video transfer is richly textured with superb detail, and the audio mix faithfully reproduces the movie's stark, isolated soundtrack. Criterion has put together an exceptional collection of supplements, including a fascinating and utterly exhaustive fly-on-the-wall documentary that offers a rare peek into both Bergman's artistic processes. The film's depressing and emotionally draining content won't be for everyone, but this is a fantastic release for a very strong film. Highly Recommended.